The Cleveland Indians minstrel show: Fans painted to resemble the outrageously racist mascot are shown without comment in the mainstream media. Enough. For a short while Wednesday morning, the lead photo on the front page of ESPN.com depicted some Cleveland Indians fans at Tuesday night's ALCS Game 4 with their faces made up to resemble the Indians absurdly racist caricature mascot, Chief Wahoo. The photo was replaced early in the day by one of Kobe Bryant as his possible trade from the Los Angeles Lakers became the top story. On ESPN.com's baseball cover the lead photo was of Cleveland relief pitcher Rafael Betancourt. The photo of the fans became a topic of discussion in this column's letters thread as well as other places around the Web, including at Deadspin, where Will Leitch wrote, "We don't want to sound like the PC police here, but seriously now: Is it really OK for Indians fans to be dressing up in red face?" I don't mind being called p.c. so I'll answer: No. It's not OK. I suppose reasonable people can disagree about whether the team name Indians is offensive, but there's just no arguing about Chief Wahoo. It's a Little Black Sambo-style caricature that should have been retired decades ago. If those fans in Cleveland had been in minstrel-show blackface, ESPN never would have run a photo of them without comment, as simply a depiction of happy fans in the stands. The picture only would have run as the centerpiece of a story about fan racism. And there is nothing about grinning-Indian redface that's even a little bit less racist than minstrel-show blackface. In an e-mailed statement, ESPN spokesman Paul Melvin said, "The photo came down due to normal, daily editorial cycle. However, we have also discussed the photo choice internally and determined that we must, and will, be more selective as the series progresses." The Indians realize at least some of this. Chief Wahoo is not as ubiquitous as he once was. The official, in-stadium mascot is now a generic Youppi-esque critter called Slider. A search for "Chief Wahoo" on the Indians Web site reveals one mention in 2007, a reference to a fan's tattoo. Yeah, he's a thing of the past. Except he's on the uniform, and his image is all over the site, though you might not notice at first glance. Joe Posnanski of the Kansas City Star, the best baseball writer in the business and a native of Cleveland, has a long post about Chief Wahoo on his blog that includes a history of the mascot, a discussion of how the founding myth of the team name -- that it was a tribute to Louis Sockalexis, a Native American player for the old National League Cleveland Spiders in the late 1890s -- is complete bull, and Posnanski relating that as a child he wore plenty of Chief Wahoo imagery and liked it. "I love Cleveland," he writes. "I love the Indians and I even love Wahoo in a weird way because it is such a part of my childhood. But it is not just time to get rid of Wahoo, it is way, way past time." I'd like to see the Indians get rid of the team name too, because whether the name itself is offensive or not, it lends itself to this type of racist caricature, which also includes various teams' version of the Tomahawk Chop. This column is on record as favoring Posnanski's suggestion that the Indians revive that old Cleveland baseball nickname, the Spiders, which I think would be a marketing bonanza. More than a decade after the single year my home city had a team in the International Hockey League, I still get comments on the rare occasions I wear my rapidly deteriorating San Francisco Spiders T-shirt. You may have heard about a certain arachnoid superhero who moves a little bit of product. But this column is not stupid. The Cleveland Indians are not about to throw 90 years of brand loyalty down the dumper when they're on an upswing between the lines and at the box office. But is it too much to ask that outrageously racist caricatures of peoples on whom this country has perpetrated genocide be retired? The answer is no, it's not too much to ask. As Jonathan Zimmerman wrote in an excellent commentary this week in the Christian Science Monitor, "How can we profess equality of all Americans, then mock the first Americans in our sports teams?" The Indians are one win away from a bully pulpit. This would be a great time to make a statement. 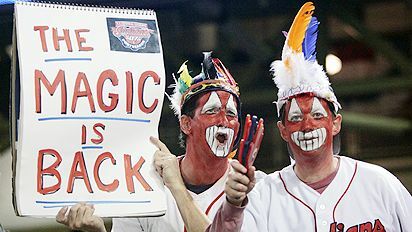 This -- 2007 -- would also be a good time for the mainstream media to stop displaying without comment photos of fans of the Indians and similarly named teams engaged in ethnic mockery as though that were the same thing as San Diego Chargers fans wearing hats with lightning bolts on them. And on a related note, American Indian Movement activist Vernon Bellecourt died this week at age 75. He spent much of his adult life fighting the use of Native American names and imagery by sports teams, and while that fight has seen a lot of success on the high school and college level, Bellecourt goes to his grave not having won any concessions from what he called his "big four" professional teams: the Washington Redskins, Kansas City Chiefs, Atlanta Braves and Cleveland Indians.